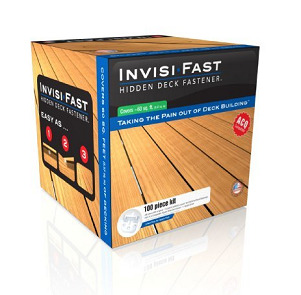 PRODUCT: # IF-SS500-018, 500 piece Invisi-Fast 1/8" Invisible Deck Fastener Kit with Stainless Steel Screws. Our 500 piece kits come with 440 pieces with a spacer and 60 without a spacer for perimeter fastening and 1500 1-1/8" tainless Steel screws. • Easy to install for the average homeowner.